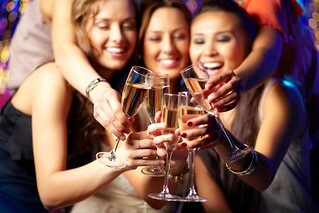 Find everything you need for a fantastic hens party in Hawkes Bay. We can help you plan and book a complete hen party break. Why You ladies Should Have A Hawkes Bay Hens Party! This is the wine country. There, need I say more? WINE country. It’s also exquisitely beautiful and Napier has fantastic art deco architecture. There are some cool events designed around the art deco theme like dressing up in fashions of the 1930s and going to themed festivals and parties. What’s not to love? The usual drive, fly or bus are all available and easy. The Most Awesome Hawkes Bay Hen Day Ideas! include lunch in your tour. Having your wine expertly matched to your meal by those in the know is always useful. This is a Hawkes Bay must do! Cycle between vineyards on flat, dedicated bike trails that are suitable for all fitness levels. A van can follow you to carry any wine that you buy as well as rescue you in case of a flat tyre. Not to mention that if you indulge a little too much in the wine tasting, you can give the bikes a rest and get a ride. Forget the gym because this hens’ activity will have everyone looking their best on the wedding day. Shimmy down the pole, turn upside down, and contort your limbs in ways that you didn’t think possible. This pole dancing lesson means that fun is guaranteed for any hens’ group. It’s also a great workout. An experienced instructor will be there to give you pointers and inspiration. Get rid of pre wedding stress by shooting at your friends! Seriously, your hen party is going to love playing paintball, especially if there are a few of you with a competitive streak! This messy sport will have you all in fits of laughter. Think Great Gatsby. Have your group dress up for an elegant gourmet dinner in a VIP private room. Since this is the Hawkes Bay, the art deco capital of New Zealand, why not choose a 1930s or 1920s inspired theme so you can all look glamorous in red lipstick, pearls and elegant gowns? This is a great way to include fun hen party games into your weekend. We can give you some great ideas‒just let us know how naughty you want them to be. All aboard the party bus! Step onto a VIP bus to be transported around the region. Choose your party bus‒a fully stocked bar, music, a pole to show off your new pole dancing abilities (see above‒some of you will be itching to give it another go). It can take you on a pub crawl or just drive around the sights of the Hawkes Bay such as the haunted prison. Let us tailor it to your desires.